I had the chance last week for a chat with Ken Rudin and Alex Moissis of LucidEra, and a preview of their SaaS business intelligence offering aimed at the SMB marketplace that is being released in general availability today. Rudin, LucidEra's CEO, was previously with Salesforce.com, Oracle and Siebel CRM OnDemand, so you have to assume that he knows something about both BI and SaaS; Moissis, VP of Marketing, had a long run at Business Objects in product marketing and product strategy. In most BI projects that I've seen, ROI comes quickly -- usually less than a year, sometimes less than six months -- since it allows analysis of costs, revenues and risks in ways that just aren't possible using spreadsheets and paper reports. Once the patterns in the data are made visible, companies can act on these trends to cut costs and increase revenues, either in a manual or automated fashion. This is great if you have hundreds of thousands of dollars to spend on a big BI solution, and an IT team to put it in place and get the initial reports up and running, but not so great if you're smaller, with less money to spend and little or no IT support for a BI project. What LucidEra showed me will help to address that issue for SMBs: a very Web 2.0-looking hosted BI application, supporting multiple data sources, and easy enough to use by anyone familiar with a spreadsheet. In short, they're trying to simplify BI enough that a smaller company with little IT infrastructure can adopt it and start to reap the benefits. There's a basic BI platform with pre-built solutions on top of the platform; some of the solutions, like their initial forecast-to-billing one, are included in the base price, whereas others may be at an additional cost, especially those created by third parties. The base price will be around $3,000 per month, which includes 100 users, 3 different data connections, and the aforementioned forecast-to-billing application. It seems like a lot of money, but think about it: the per-user price is about halfway between Salesforce.com and Blueprint. Welcome to the world of paying for your "enterprise" software monthly on your American Express card, and stopping it at any time that you're not happy with it. Setting up a new company in LucidEra is a self-service activity, and LucidEra doesn't even offer professional services to assist with this, although they do provide telephone and online support. Typically for their beta customers (of which there are about a dozen, ranging in size from less than 50 to several hundred employees), this takes up to five person-days spread over as much as three weeks, and is mostly about getting the data sources properly hooked up and doing some data cleansing on the results. Although I didn't review this process, it sounds as if you're not going to need professional help for this one, just someone internally who understands your data sources already. We spent quite a bit of time looking at the forecast-to-billing application, doing some slicing and dicing on the data. 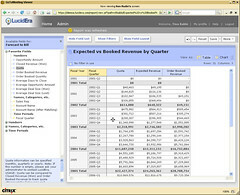 In the sample that we looked at, the customer data (expected revenue) came from Salesforce.com, the financials (booked revenue) came from NetSuite, and the quota information came from an Excel spreadsheet. These are just three of the data sources that LucidEra can support in any combination: for example, the financials could have come from Oracle Financials instead. The really cool thing is that there is no distinction between the design and view environment: if you're viewing a report, you can change it interactively. We added fields to the report, filtered it, grouped by fields (creating the equivalent to an Excel pivot table) and viewed it as a graph, all through dragging things around on the screen. If we didn't like our changes, we could undo them one at a time, or revert back to the original report. A few technical notes: the client is purely browser-based, and will run in IE or Firefox on Windows. Ken was going to confirm whether it ran on other platforms (Mac and Linux) but I haven't heard back yet. They developed their own back-end database based on the Broadbase data warehouse source code and some open-source technology, then rebuilt for multi-tenancy, ease-of-use and to optimize for the SaaS environment. All of this was put together in about 15 months, a timeline that they could not have accomplished except by using the code bases that they started with. The press release isn't up on their site yet, but you should be able to find it, and all the other information, there later today. BI isn't a field that I usually cover in depth, but keep in mind last week's themes at the Gartner conference: visibility and agility. 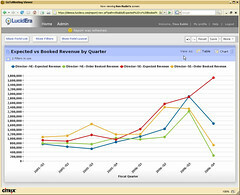 BI combined with BPM is one of the ways that visibility into business processes is being realized. Can BPM Related Learnings Smooth Entry to the Cloud? Will Lombardi Acquisition be the Straw that Breaks the IBM BPM Camels Back?